Finance PPC Trends in 2019: Traffic and CPCs are Rising, mobile dominates search with 72% share and What You Need To do to stay ahead | Clicteq | PPC Agency London, Humans, I don't see any? According the data from Google overall search growth comparing Q4 2018 to Q4 2017 there has been a 4% increase in search volume for the lending and business lending related terms and a 12% growth in search volume related to business credit cards. Competition is also hotting up with CPCs rising by 7% YoY for lending terms and 3% YoY for credit card terms according to Google’s vertical reports. In this article we’re going to look at the key changes in the paid search landscape for the lending and credit card sub verticals of the finance sector and what you need to be doing as a marketing director to react to the shifting landscape to stay ahead. Analysing data for CPC year on year there have been some clear jumps in CPC around January 2018. 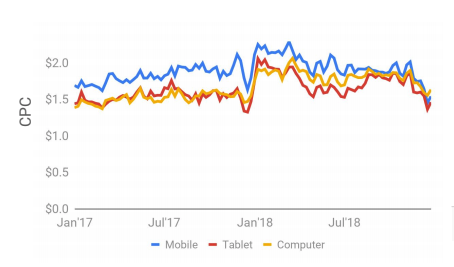 As we have progressed towards 2019 CPCs for mobile, desktop and tablet have fallen but are now still 3% on average above where they were back in Jan 2017, showing rising levels of competition for these terms. With any increase in CPC it is going to directly impact your CPA and most advertisers are likely to be stung with CPAs rising in line with CPC as competition hots up. Focus on lifetime value through cross selling different financial products. This strategy works by instead of decreasing CPC it increases the amount you can effectively pay. We work with finance providers that on average lend to somebody twice per year on average. Here as they are funded like most Fintech companies they can afford two spend twice the amount to acquire customers allowing them to bid more aggressively and grow as well as being able to absorb slightly higher CPCs. Cross selling financial products also works well, we often see credit card providers that also provide business loans sell a credit card first and then a loan or overdraft after increasing lifetime value and allowing them to compete more aggressively on high volume competitive terms such as business loans. Focus on improving Quality Score through improving relevance. Quality score directly affects CPC. In fact this study by Wordstream showed that increasing quality score from 5 to 7 on average would decrease your cost per click by 28.60%. Increasing quality score is quite an in-depth topic and we’ve discussed it fairly comprehensive in “how to increase quality score from 5.56 to 7.95 in 90 days”. If you’re not already tracking your Quality Score on a day to day basis then I would suggest implementing this Adwords Script, which is a tool that will do it for your automatically. Consider allocating more budget to Bing. According to data from Wordstream clicks on Bing are 33.5% cheaper than clicks on Google. Although Bing’s market share is sub 10% in the UK it does still drive a reasonable amount of volume in the finance sector so we would suggest provided that CPAs are lower (which they almost always are) allocating as much budget to Bing first as it will take and then allocating the left over to Google. Take a multichannel approach to your paid search activity. One of the key factors that affects Quality Score is click through rate, which is heavily affected by brand recognition. A strong cross channel branding campaign ran through, paid social, programmatic, print, TV and out of home will increase brand awareness, Google CTRs and reduce your CPCs. When making decisions on your budget allocation it’s therefore key to look at cross channel attribution and determine the impact of spend on branding on paid search performance. You should however look at branded traffic and non-branded traffic in isolation. Branded traffic will of course increase with branding activity, however what is of real interest in the effect on CTR, CVR and CPA of non branded activity. Google announced that in may 2015 that mobile searchers had overtaken desktop searchers and the percentage of searchers that are mobile is now increasing year on year in the finance sector. It’s no longer good enough to be mobile optimised, to win in 2019 and beyond you need to shift your focus to mobile first. According to Google’s trend reports for loans and business lending desktop and Business credit cards there has been an ever increasing move towards mobile devices. In 2018 mobile devices search share rose by 15% while tablet and desktop dropped by 13% and 5% respectively. According to data from Google Mobile devices now account for a whopping 72% of clicks for business credit cards, 20% is on desktop devices and tablet devices are now only seeing an 8% share of searchers. Mobile is also seeing the smallest increase in CPCs year on year, while CPC on desktop grew by 19% mobile only saw CPCs increase by 3% representing a great opportunity to compete. Source: Google business credit cards vertical reports. Build your UX around mobile as opposed to desktop first. Building your UX around mobile first as opposed to building a desktop site and then adapting it to mobile is a great step towards being mobile focused. It’s also key to make sure that your landing pages load really quickly as internet connection on mobile devices will not always be as quick as you would expect on desktop device. Data from the huffington post found that 57% of people will leave a mobile website if it doesn’t load within 3 seconds. Have a different bidding strategy for mobile compared to desktop. If you’re not using an automated bidding type like tCPA or tROAS then you need to consider how you’re going to bid differently for mobile compared to desktop as the performance will vary significantly. We would at the very least suggest using mobile bid modifiers, which you can calculate automatically with this script. You an also blend mobile bidding into bidding based on time of the day as different devices perform differently at different times of the day. We would suggest using this 24 hour bidding script to automatically change bids hourly based on your desktop and mobile performance. Have mobile preference creatives but don’t segment ads by device. Siloing where you would create mobile only campaigns by excluding desktop and tablet is generally not the best strategy when creating mobile specific creatives as it will just mean your data gets spread between 3 campaigns meaning you can’t test as quickly and making your account bloated and unwieldy. We would hower suggest creating mobile preference ad copy where you may want to change your call to action to “call now” if you want to drive phone applications for example. Furthermore you should look to create shorter ad extensions. Sitelinks on mobile should be kept under 15 characters to allow several to be show. This has been shown to increase CTR by 15%. Consider how people use voice search to search on mobile devices. 2018 seemed to be the year of voice search with people projecting that 50% of all search volume being done by voice by 2020. How will this affect the finance sector? We would expect search queries to get longer and as a result advertisers will have to expand out keyword lists to improve relevancy and write more relevant ads. However looking at the early signs of how people are using voice search it seems fairly conclusive that most voice activated devices are used to search for information as opposed to products. We would therefore expect voice search not to have a large effect on commercial searchers in the short or mid term future unless the way the technology is used fundamentally changes. Comparing 2017 to 2018 there was a steady 12% growth in index search queries. Looking at the data there was a similar growth comparing 2016 to 2017. We would therefore expect to see in the region of 12% organic growth over the next 12 months in search terms. Overall from the report we would suggest using the following forecasts for your 2019 media plan as a base level and then adding a forecast based on campaign improvements on top. 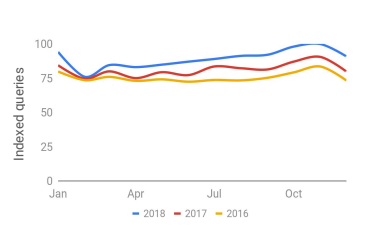 There are some quite clear seasonal trend when looking at Google’s data from their vertical trends report for the Business credit card sub vertical. In terms of clicks and search volume, January is a hotspot for business lending with December being a lower point. One thing to consider however is even though search volume is lower in December, people applying for loans to make payroll that has been pushed forward are likely to be motivated buyers. There are also spikes around June in terms of increased search volume and a significant hike in CPCs towards the back end of the year in November and December in 2018. This however was not the case in 2017 or 2016 so may simply be related to an overall increase in CPCs. Overall when looking at YoY performance comparisons were seeing CPCs rising by 7% YoY for lending terms and 3% YoY for credit card terms according to Google’s vertical reports amid greater market competition. In 2018 mobile dominated search and we expect share to grow even further in 2019. In 2018 mobile account for a whopping 72% of clicks for business credit cards, 20% is on desktop devices and tablet devices are now only seeing an 8% share of searchers. In terms of media planning there are two main takeaways, firstly search volume is increasing with a 12% increase in indexed search queries YoY along with Click and CTR which have risen 3% and 4% respectively. CPCs have also risen YoY by 3% and we expect for it to rise again this year at a similar rate. We would suggest factoring these organic increases into your media plan when you plan your budget for 2019. A second takway would be to focus more budget (80% of spend) in the first 3 quarters of they year as search volume drops of considerably in December for business lending.